HTC's Evo 3D: Evo gets a turbo-charged, dual-core update. 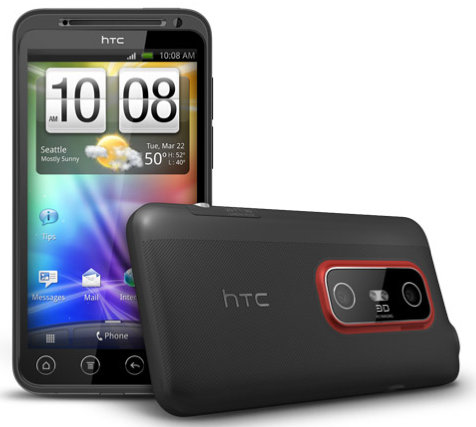 HTC’s Evo 3D: Evo gets a turbo-charged, dual-core update. Sprint‘s Trevor Van Norman understands product life cycle. As part of Sprint’s product marketing team, he knows that a hot new phone will typically have a 3-4 month run of incredible sales, and then it will start to taper off. Van Norman said that, when it came to the HTC Evo 4G, that simply wasn’t the case. The Evo has had a steady flow of sales and interest since its introduction in June of 2010. Given that it was Sprint’s (and the US’s) first 4G device, it’s not terribly surprising. Add to that the fact that the Evo 4G is still just a great phone and you have a recipe for assured success. How do you top one of the best-selling phones in your company’s history? That’s what Sprint and HTC had to ask. The answer is the Evo 3D. HTC broke the mold somewhat and came out with a phone that has stunning specs, plus the forward-looking 3D technology. 3D might not be a huge deal today, but it very well could be someday soon. The Evo 3D features a 4.3-inch QHD screen at 960×540 resolution, with glasses-free 3D. It has two cameras — 1.3 megapixel does the front duty, while two 5-megapixel cameras are on the back — to enable the user to create 3D content. Oh, and there’s nothing special about using the phone in or out of 3D mode. It’s as simple as a rocker switch, located next to the physical camera button. There’s been a pretty significant speed boost for the Evo 3D, too. It’s running a dual-core, 1.2 Ghz Snapdragon CPU. Interestingly, the phone can throttle down to using only a single core, unless the power of the 2nd core is needed. This should save some battery life, but neither HTC nor Sprint are ready to talk about hours and minutes just yet. Speaking of the battery, it’s been beefed up too. A 1,730 mAh battery powers the 3D, along with its 1 GB of RAM, 4 gigs of internal storage and included 8 GB microSD card. HTC’s Sense overlay gets a pretty serious refresh for the 3D. There’s a carousel-style selection to your home screens, so when you reach the last one, it just keeps spinning instead of making you return all the way back to the first. There’s also deep integration for third-party apps from Amazon, among others. What really caught my attention about the new Sense is the lock screen. There are a few to choose from, and you can customize them fully. In fact, one lock screen is so handy that I might even buy the phone just because of it — It allows you to have 5 icons on the screen, and dragging your finger to them will unlock the phone directly to the application that you’ve chosen. It’s just a slight time-saver, but it’s incredibly handy. Speaking of handy, you’ll notice that there’s no HDMI out for the Evo 3D. HTC has transitioned over to the MHL standard, which allows a single MicroUSB port to serve as both the charge/data link and an HDMI-quality output. While I might not be completely sold on the idea of mobile 3D just yet, there are enough extra advantages to the Evo 3D that keep it as a top-tier choice for my next phone. There isn’t a price set yet, but we’ll know soon enough. The Evo 3D will be launching on Sprint mid-summer of this year.